The president tweeted that Mexico is doing little to stop the "caravans" as he called on Congress to immediately pass "tough laws." President Donald Trump has spent the last three days warning about dangerous "caravans" of immigrants headed for the U.S. border with Mexico, bringing drugs and crime with them. Mexico is doing little to stop these "caravans," Trump complained, so Republicans in Congress must "...pass tough laws NOW." So, what's Trump talking about? A group of more than 1,000 migrants are on a monthlong trek — on foot, in vans and by train — from Central America through Mexico toward the United States. Some will seek refuge in Mexico, others in the United States. The majority are from Honduras, according to Buzzfeed, which has a reporter with the migrants. 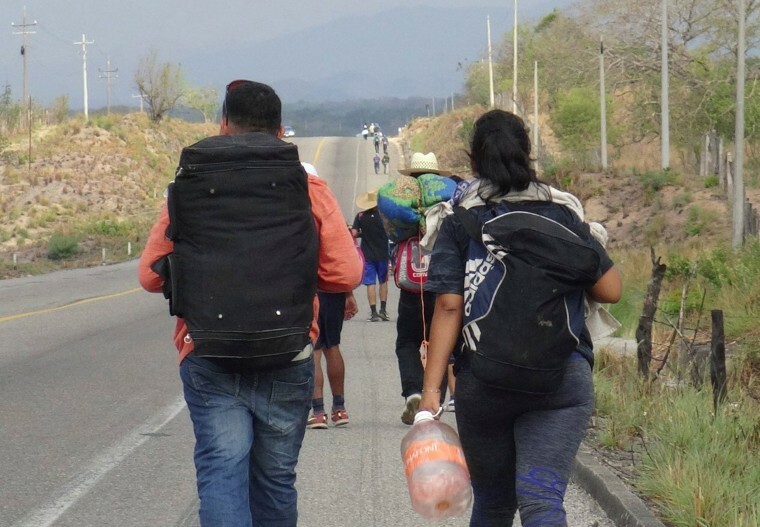 The migrants have banded together to both make their journey safer and to publicize the dangerous conditions they are fleeing, according to Denise Gilman, a University of Texas law professor. Gilman is a co-director of the school's Immigration Clinic and an immigration attorney. She was contacted by organizers since she provides legal advice to immigrants in Texas, where some of the caravan's migrants could end up in detention centers. "These are families — women, children, men, too — fleeing horrific violence," Gilman said. "They're fleeing crime, they are not criminals." The march was organized by a Central American and Mexican-based group called Pueblo Sin Fronteras (People Without Borders), which said in a release they are seeking refuge from violence and corruption. The group did not respond to a request for interview. Mexican authorities have not stopped the group as it makes it way through the country, with many seeking entry to the United States, according to Buzzfeed. What happens if and when they reach the U.S. border? Asylum seekers are screened with a "credible fear interview" within weeks of their arrival, Gilman said. If they do not pass, they are deported immediately. Those who are determined to have a credible claim for asylum will then proceed toward an asylum hearing in immigration court. Pending an asylum hearing, some immigrants are released to live with nearby families, while others will be detained in immigration detention housing, which was widely expanded as part of the Obama administration's immigration enforcement. But they may never make it. The Associated Press reported Tuesday that the caravan "was sidelined at a sports field in southern Mexico with no means of reaching the border..."
Could Mexico still stop them? "In recent years, the Mexican government has tried to keep Central Americans out because they don’t like to be an avenue for migration," Johnson said, but he pointed to international law mandating that people be free to leave any country, including their own. "I don’t see there’s evidence that Mexico’s not doing what it’s supposed to be doing under international law." Mexico could have barred the migrants from entering its own country, but it's unlikely they'll stop them from trying to enter the United States. Is "catch and release" a "liberal (Democrat)" law, like Trump says? There is no "catch and release" law that stops U.S. authorities from apprehending migrants at the border, as Trump claimed in a tweet. Rather, the phrase refers to a past policy of letting certain immigrants without documentation live in the U.S. while awaiting immigration hearings. Gilman said it was not a widespread practice under the Obama administration, and is not now. The president announced he was ending the practice with an executive order more than a year ago, too. "Almost everybody is detained at the border until at least they pass the (initial asylum) screening interview, and increasingly after," Gilman said. Can the migrants receive DACA status? Trump gets this wrong. The Deferred Action for Childhood Arrivals (DACA) program is not the same as asylum, and anyone who crosses the border now is not eligible for DACA. The Obama-era DACA program, which is the subject of a legal battle after Trump ended the program last year, allows children of undocumented immigrants, known as Dreamers, to remain in the U.S. if they were under 16 when their parents brought them to the U.S., were under 31 in June 2012, and had continuously lived here without legal status since at least June 2007. The only people who can currently use or apply for DACA are the the 700,000 young people currently enrolled thanks to a lower court order that remains in effect. "Asylum would give you a path to legalization and lawful resident status — DACA doesn't give you that," Johnson added.